And even in 1921 there were trees leaning out over the river, just like you see there today. Today, my wife bought me a tin of chocolates from Purdy's. That's not how I start most of my train photo posts, but this one is different. 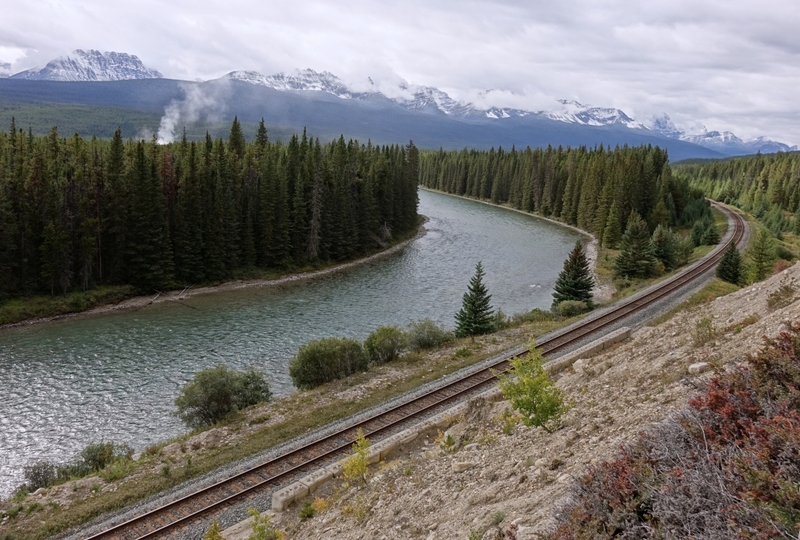 I immediately thought "Morant's Curve" but then realized it was a bit similar but not a good match to my favourite spot. I'm concluding that the chocolates tin design by inspired by Morant's Curve. This tin photo is a genuine image looking westward at the Storm Mountain lookout along Hwy-1A, Bow Valley Parkway. Not Morant's Curve, but almost as nice. There's an image taken in the exact same spot in my Natural Resource Development textbook that I used this year. There was no (useful) caption, so I appreciate the identification of location. Nice bit of sleuth work. I was unaware of this viewpoint, but I am now. Last summer I spent a night at the Baker Creek Chalet, just a little to the west of this place. Had I known, I would have gone & checked this spot out. Photo-location sleuthing is fun. Google Earth (with it's various user photos) and Google-Maps street-view are good tools. Street-view recently was added for the Bow Valley Parkway, including the Storm Mountain lookout parking lot. 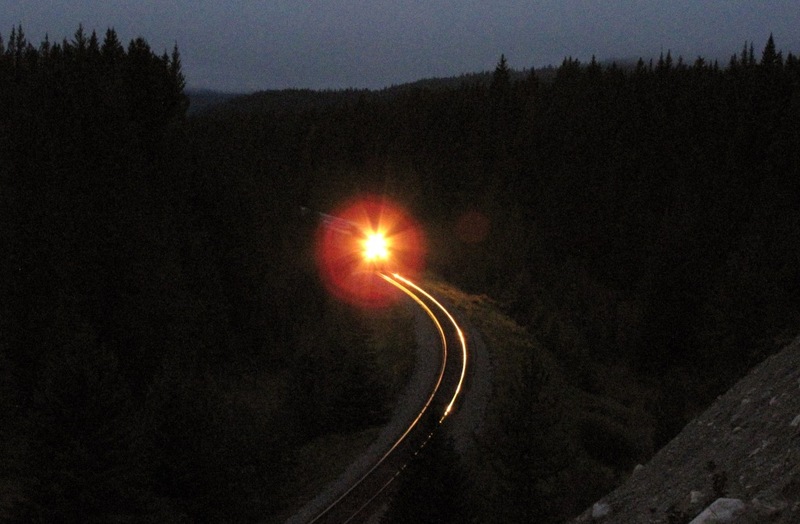 One more bit of sleuthing, and this involves Morant's Curve. It's funny, most people stay on the highway but there's still enough traffic to the top of the cliff to leave a small and braided trail. 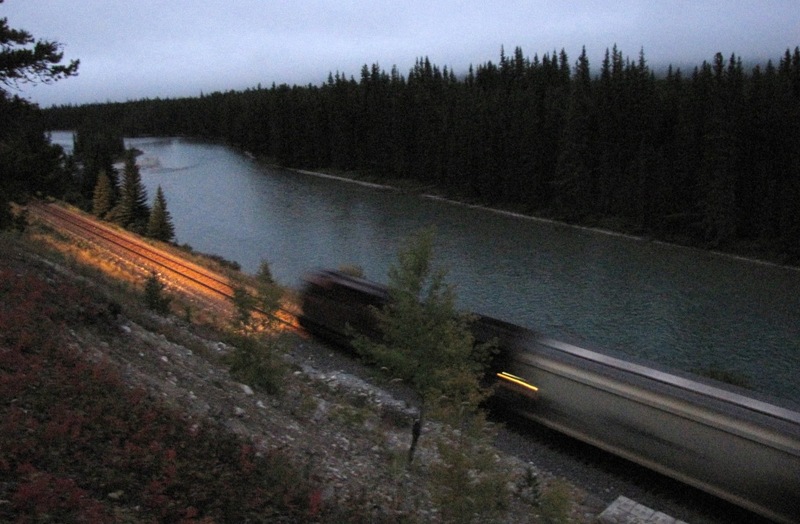 ps: Who here, besides myself and WCK, has been to and/or taken photos from Morant's Curve? Michael H? The last time I was in that area was 2008. I wanted to stop there, but didn't research how to get there. My dad was more interested in seeing Lake Louise, which we didn't end up seeing either because all the parking was full. 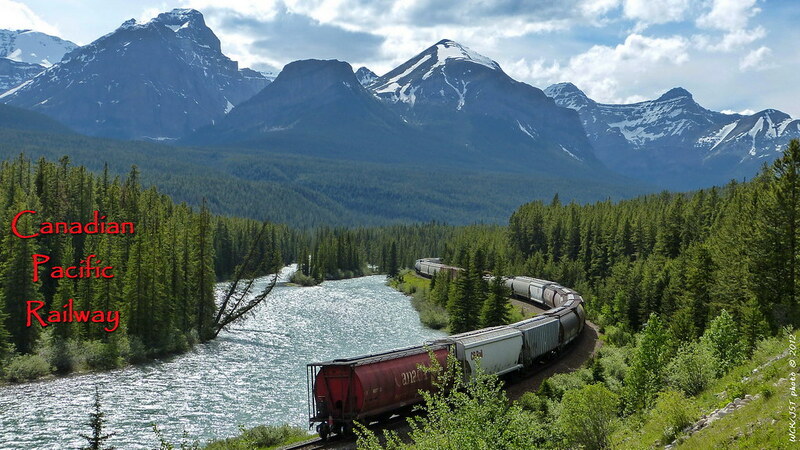 Being in the Banff/Jasper area in peak tourist season can be a real pain. The area is simply loved to death by so many people. I recommend September, if you can do it. 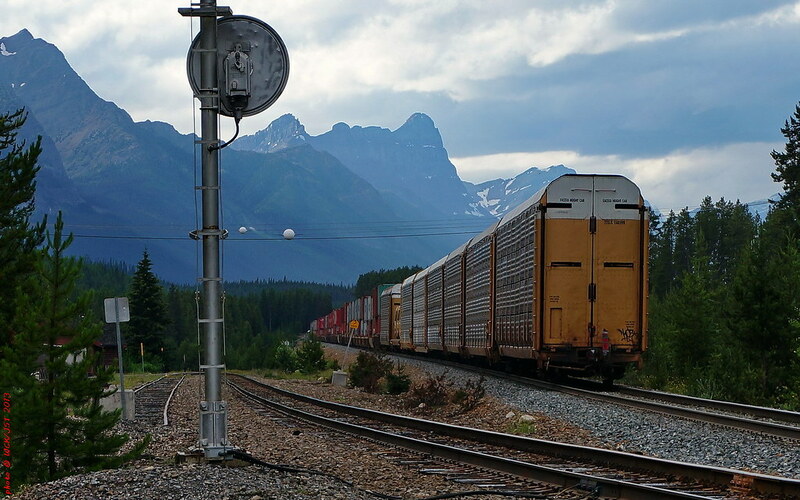 Here are some of my 'CP east of Kamloops' to the Alberta border & a little beyond photos. These shots were taken over the last couple of years, and have not been seen here on the WCFF, though they have been on my Flickr site for some time. These photos are roughly in geographical order moving west to east along CP's main line. 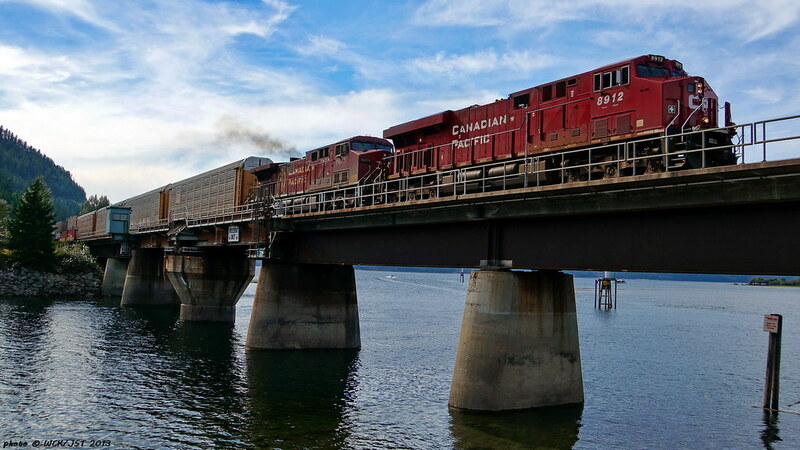 CP # 8912 leads east bound intermodal over swing bridge crossing channel separating Shuswap & Mara lakes - Shuswap Sub @ Sicamous, BC - 20 September 2013. For more photos at this site see Mr. Horn's work from last summer earlier in this thread. 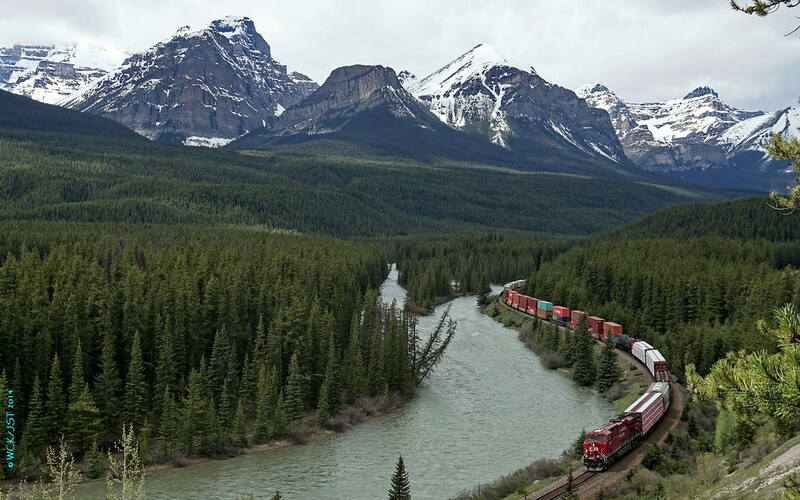 Canadian Pacific double-stacked box train on Laggan Subdivision @ Lake Louise headed onto the west bound 1% ascending main track leading to Kicking Horse Pass - 22 July 2013. 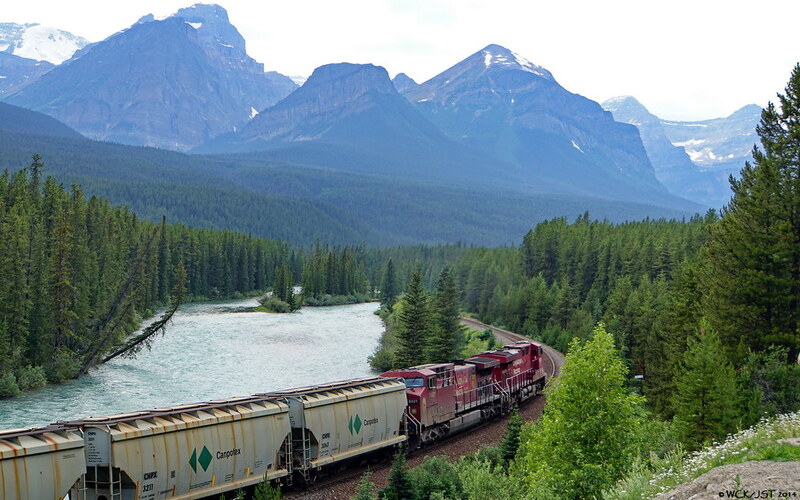 Tail end of CP intermodal train on 2nd (west bound) 1% ascending main track (Laggan Sub) @ Lake Louise, Alberta, leading to Kicking Horse Pass - 22 July 2013. The track at centre left is normally used by east bound trains descending the grade from the Pass. It runs by Lake Louise station visible on the left. It is the original line, constructed in the 1880's. 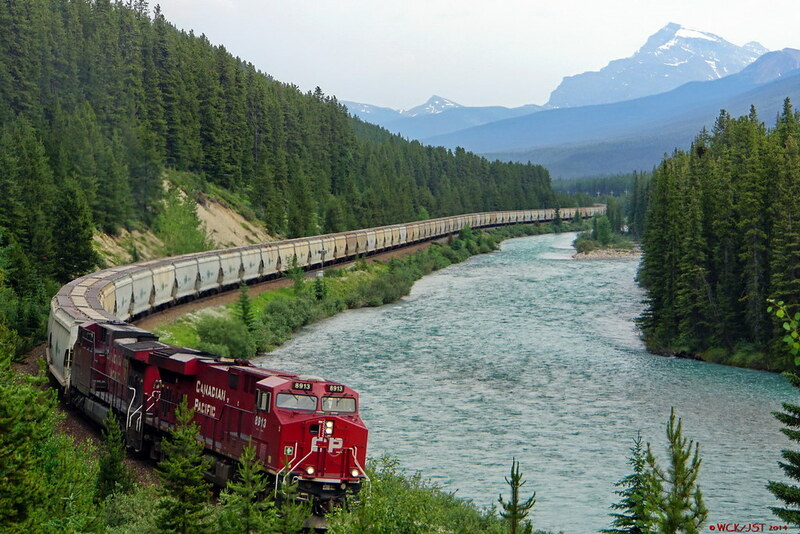 The train shown here is using the 'new' track constructed a hundred years later in the 1980's as the Lake Louise '2nd Mainline'. 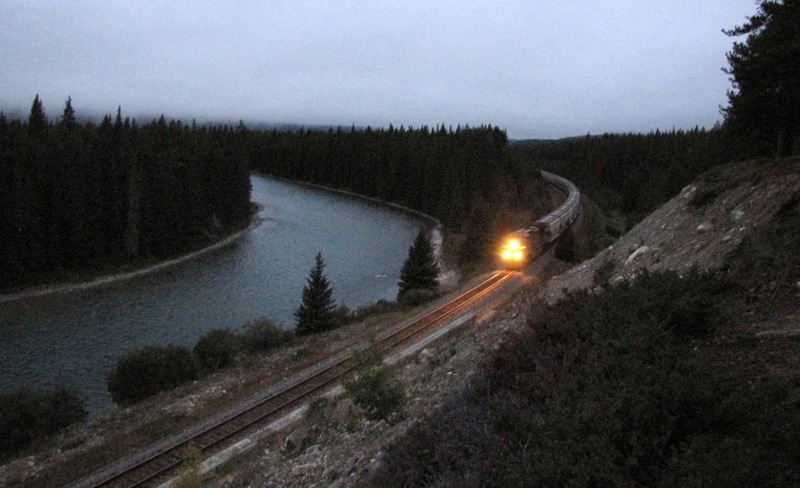 Lake Louise station, btw, was originally called 'Laggan'. CP's Laggan Subdivision is named for this place. 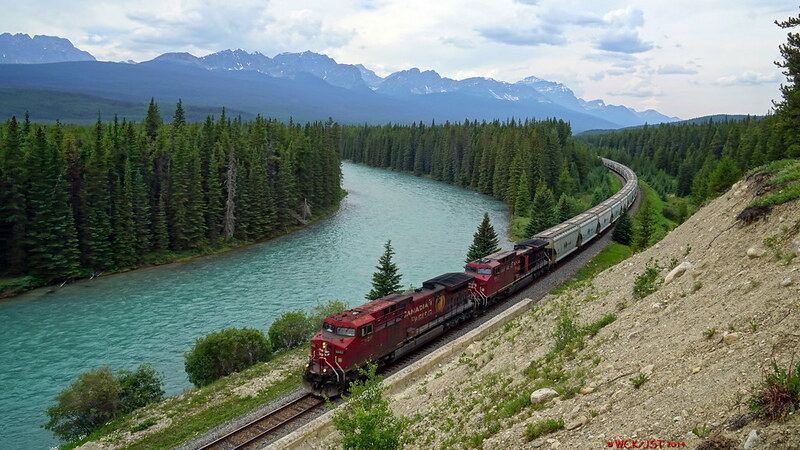 CP west bound mixed intermodal on the 'new' 2nd main line, Laggan Subdivision, @ Lake Louise, Alberta - 23 July 2013. 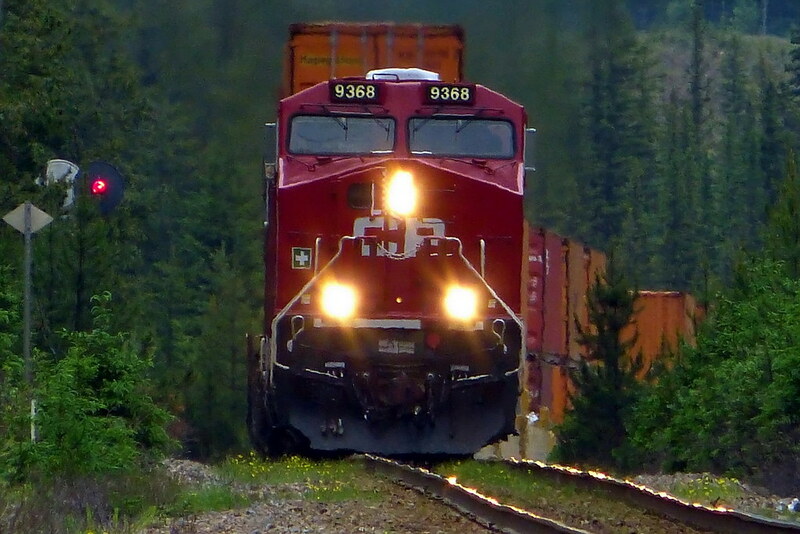 This train is about to cross over the Trans Canada Hwy #1. 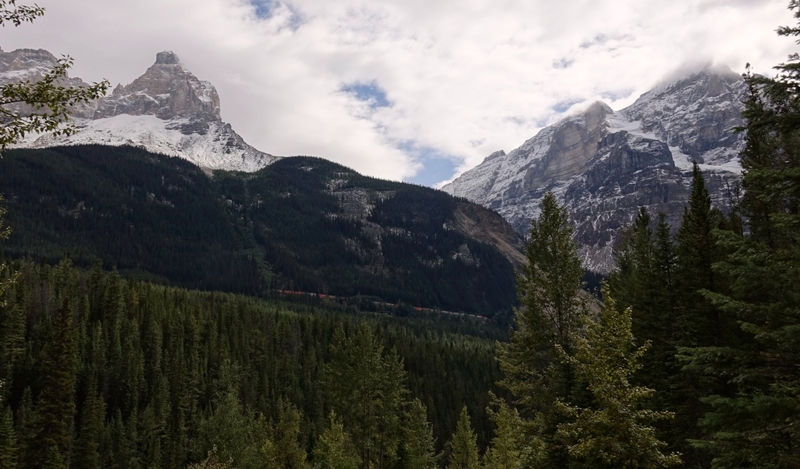 That glacier clad peak in the background is Temple Mountain, at 3544 metres the highest peak in the Lake Louise area. 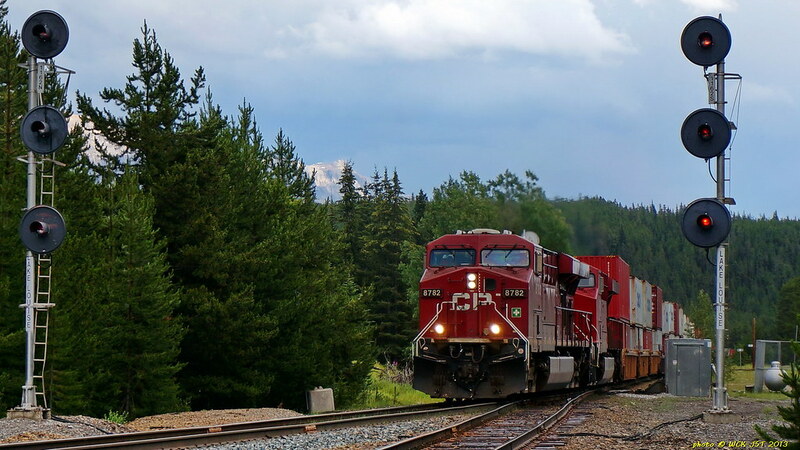 CP 8891 leads west bound mixed intermodal through signals @ west (upper) end of Lake Louise 2nd mainline, Laggan Sub, on the BC-Alberta border at Kicking Horse Pass - 23 July 2013. 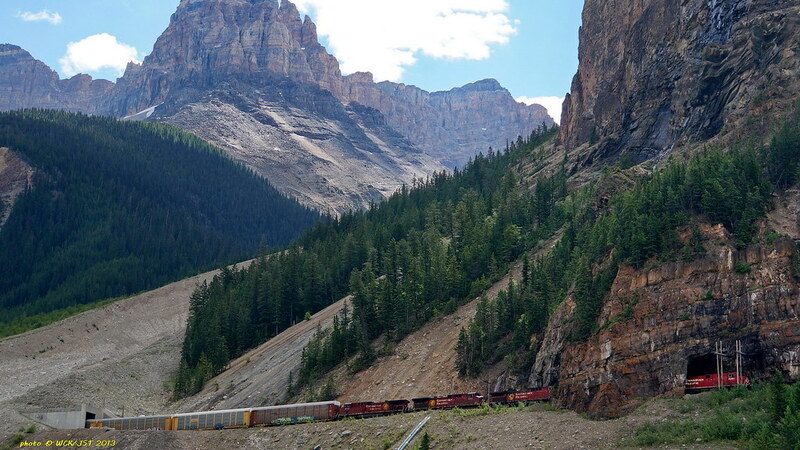 The track on the left is the original mainline with the steeper grade leading down to Lake Louise station. It is normally used by east bound trains going down hill. 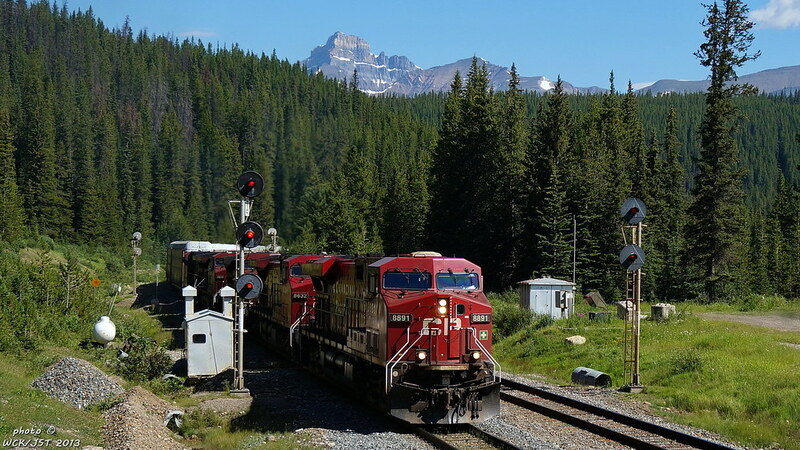 Tail end of CP west bound mixed train @ Morant's Curve - Laggan Subdivision, CP Mainline near Lake Louise, AB - 28 June 2012. That is the Bow River on the left. 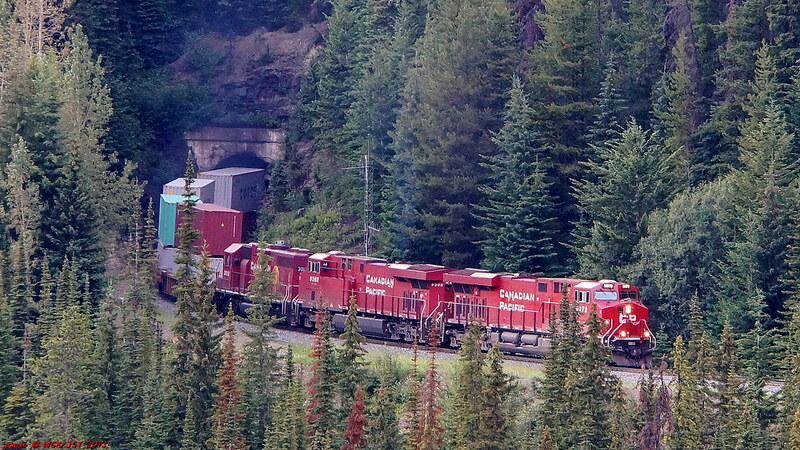 CP west bound box train on CP's Laggan Subdivision near Castle Junction, Banff National Park, Alberta - 30 June 2012. 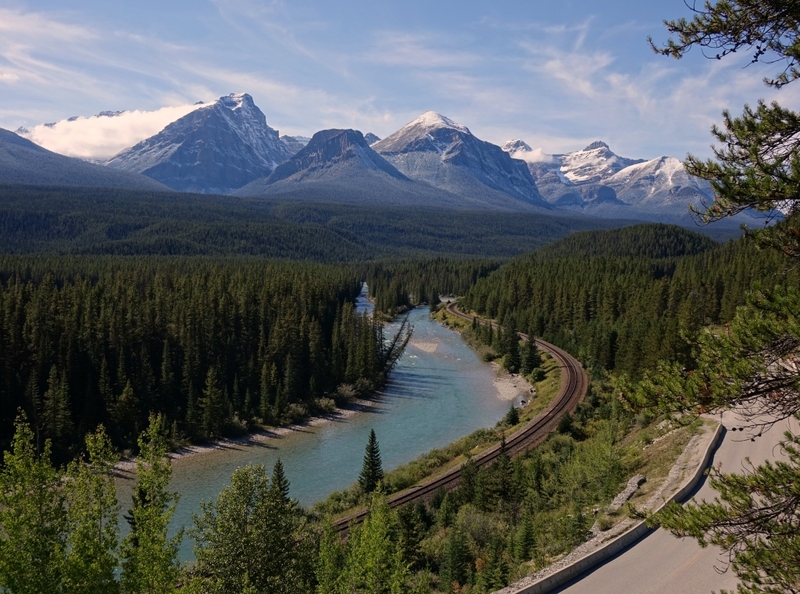 This is very near to Castle Junction where the Trans Canada Highway, Hwy 93 to Radium Hot Springs, & the Bow Valley Parkway all come together. Thanks for that great photo essay. I appreciate the Lake Louise 2nd-line visual explanations. Thanks for sharing this moment with us; it is much enjoyed. How much time did you spend at the curve, and was this the one and only train that you saw? I got lucky. I saw two trains in about 30 minutes. 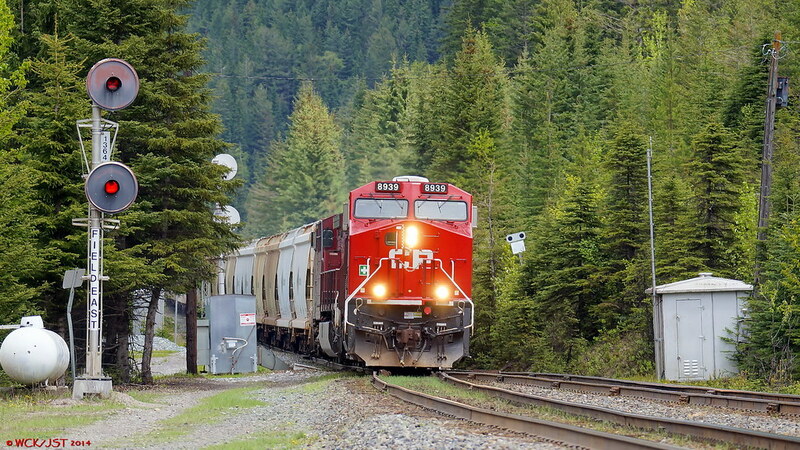 The first one was a long west bound potash train which was coming as soon as I got to the parking area there. The second one (in the photo above) was east bound & must have been waiting for the potash train to clear. That photo was taken from the high vantage point that you (Mr. Horn) mentioned some time back. The 'trail' up there is more like a mountain goat scramble, but worth it for the view. I have many more photos to share. That photo was taken from the high vantage point that you (Mr. Horn) mentioned some time back. The 'trail' up there is more like a mountain goat scramble, but worth it for the view. I have many more photos to share. Where is the best place to find the start of that goat-trail? Does it start from the back of that little parking lot, or is it roadside? 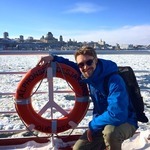 Thanks for all your sharing of photos and experiences. It does start at the back end of the parking area. This looks to be a little trail where some would go back into the woods to 'pee', as there are no facilities at this place*. Just immediately east (toward Banff) of the parking area on the roadside is a bit of a cliff that would be very difficult to climb. At the top of that cliff is your photo vantage point, which you reach via the circuitous 'goat' trail. Be warned that it is just a bit risky up there. You do want to ensure that you have secure footing. *I did not encounter any nasty surprises, however. 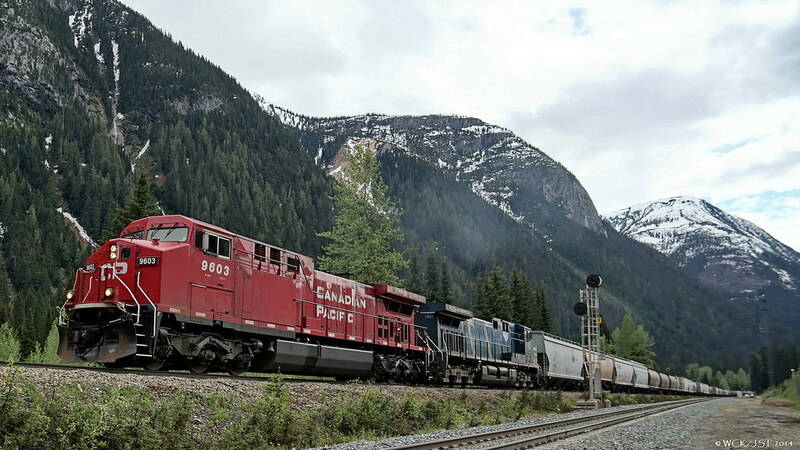 Canadian Pacific west bound potash train led by #9939 heads downhill between the upper & lower spiral tunnels on the Laggan Subdivision, CPR mainline, just east of Field, BC - 5 June 2014. These locomotives, and two more DPU units further back in the train, are in full dynamic breaking mode as this train creeps down the 2.2% grade here. The brake shoes are squealing, also... In the background is Yoho Park's Cathedral Mountain. 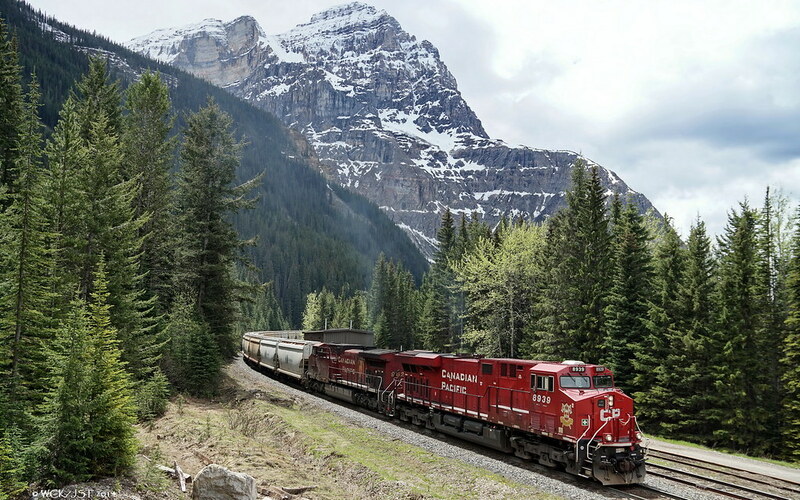 CP east bound empty grain train takes the Connaught track as it heads up to the Selkirk summit inside the Connaught Tunnel (Mountain Sub) - 5 June 2014. The track in the foreground is the Macdonald track leading from the Mount Macdonald Tunnel, the route normally used by heavy west bound trains. I'm assuming that this location is an approximate 30-second walk from the parking lot. 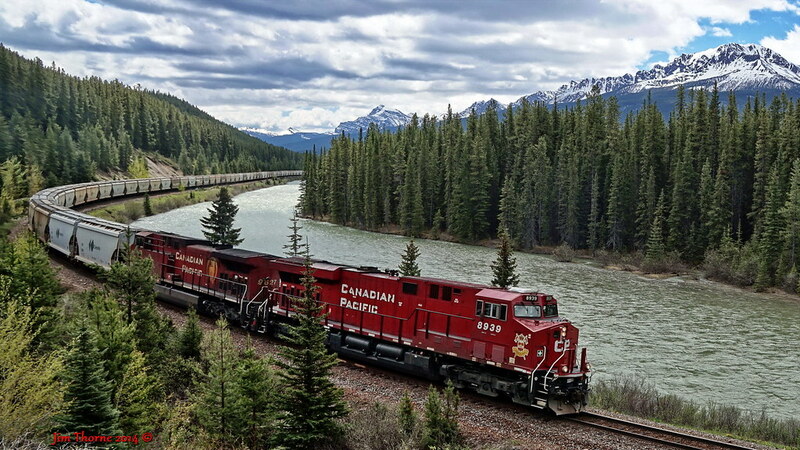 Here are two photos of a west bound loaded potash train at Morant's Curve on CP's main line Laggan Subdivision just west east (thanks Mr. Horn) of Lake Louise, Alberta. These potash trains are long & frequent (several per day?). They usually have four locomotives with two on the head end, one about half way back in the train, and the fourth one on the tail end. These trains must be about two km in length. I saw this one earlier this summer while travelling through the Banff & Jasper areas. 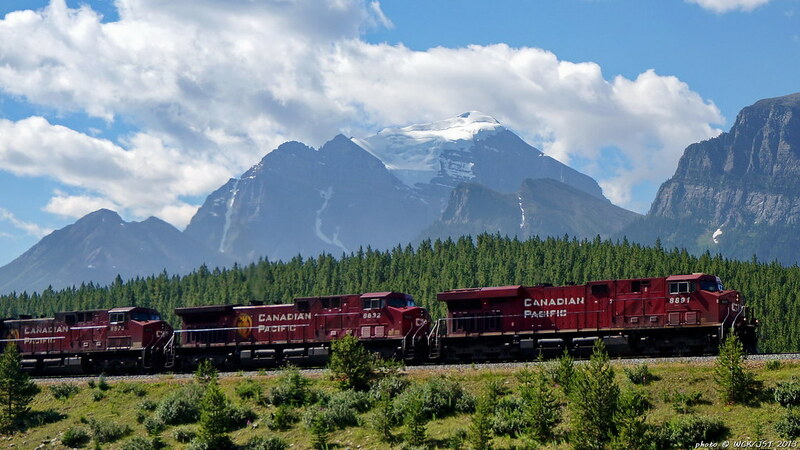 Here are two photos of a west bound loaded potash train at Morant's Curve on CP's main line Laggan Subdivision just west of Lake Louise, Alberta. Lovely photos. Minor geography typo: should say "just east of Lake Louise"
ps: thanks for the Banff / Bow Valley Parkway interchange train advice. I was at this beautiful spot for an hour today. Only one thing was missing: a train ! PS; That's a great view & the sun is shining. Get some sleep! A couple of CPR rail views from September 12, 2014. - the train is exiting the upper portal of the upper tunnel, in an upper fashion, moving from right to left. Storm Mountain lookout, along the Bow River.